Rocker or rockered soles have come up multiple times on this blog and I thought it was time to write a set post on this topic. 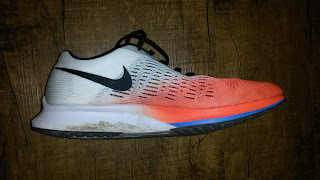 Most recently, my colleague Dr. Nathianial Kolias put up a review of the Hoka Clayton 2 (HERE), noting that the rockered soles do not tend to work well for him. My theory was that the rockered soles tend to reduce the amount of power/torque the calves can put through the natural forefoot rocker, aka the metatarsophalangeal joint by artificially rolling the foot forward. I decided to dive into the research to see what the conclusion was. The answer appears to be that having a rockered sole does reduce the load on the achilles but there is mixed evidence as to whether this may affect other joints. Sound confusing? Let's talk. Rocker shoe design is not exclusive to the Hoka brand that most runners know. In fact, they have been utilized by footwear experts and clinicians for many years to treat a variety of foot conditions, especially diabetes in the alleviation of loading certain areas of the foot. Other conditions include unloading certain joints (Charcot Foot or Hallux Valgus for example), reducing plantar pressures in those with fractures or pressure ulcers and assisting with gait deficits seen in neurologic conditions, amputations and more. So this aspect of the shoe is one of the many tools we in the medical community have utilized to attempt to change how people move (hopefully for the better). The basic concept behind rocker soles is to help the foot and ankle roll through the gait cycle, thereby maintaining forward momentum. The foot and ankle, if working properly, have natural rockers that I have talked about before. The first is the heel rocker, which consists of the rounded calcaneus that upon initial contact and loading response helps roll the foot forward along the posterior aspect of the bone down to foot flat position in early midstance. Next is the ankle rocker, which during midstance (foot is fully on the ground) rolls the tibial-fibular complex over the rounded talus at the talucrural joint, effectively rolling the whole body over the foot. Finally during terminal stance to pre-swing (aka toe-off), the foot rolls over the metatarsophalangeal joints (aka most proximal joints of the forefoot where the major bend occurs), the toes dorsiflex (or at least they should) and at the same time the calf muscles produce their maximum torque/power to push the rest of the body over this area, which is what makes up the forefoot rocker. I am a fan (aka biased) of beveled or curved heels in shoes as that may reduce the load on the anterior tibialis during initial contact. It mostly serves to assist with loading, with some data that the dorsiflexion torque is reduced (Boyer & Andriacchi, 2009). This in my mind may serve to reduce the load on individuals with anterior tibialis issues (one of the possible culprits in medial tibial stress syndrome or shin splits... a phrase I hate) as the anterior tibialis serves to help control the forward rolling during initial contact at the foot and ankle. This is better than a heel flare, which extends the heel farther posterior. This can increase the torque and load on the anterior tibialis (Powers, 2017) and I almost always steer people that land on the posterior section of the shoe from away from footwear with this attribute. The exception to this is those that need more proprioceptive input upon landing to get them to load better at the hip and knee and I have had success with that patient population (this is purely testimonial. I have not done research on this). An example of posterior heel flare. The Nike Zoom Elite 9 is intended for individuals who land midfoot or forefoot during faster running. I have not discussed how rocker shoes affect the ankle rocker and midfoot as extensively on this blog as the heel and forefoot. As the rocker shoes generally try to keep motion in the sagittal plane, joints outside of that plane tend to be a bit limited. This is one of the reasons why Hoka can claim most of their shoes work for those with neutral foot mechanics, mild supination and pronation. Due to keeping motion more in the sagittal plane by maintaining forward momentum, there is some research suggesting the inversion and eversion of the foot (part of supination and pronation respectively) are reduced (Boyer, Andriacchi, 2009). For those that use pronation extensively for shock attenuation (again a common ankle strategy attribute), this may reduce that group's ability to utilize that strategy. This can either be a good retraining tool if utilized in the right manner, or may cause excessive loading in another place the individual is not ready for (like the knee). This occurring long term without adapation is grounds for an injury. To be fair, loading any unprepared or inadequately prepared joint for long periods has the potential to cause injuries. I have discussed toe spring and the forefoot rocker in the past here but not with as much reference to the research. What has been found is that an artificial shoe rocker can cause a reduction in forefoot plantar pressures (Brown et al., 2004), achilles tendon load (Sobhani et al., 2014), and ankle plantarflexion torque (Sobhani et al., 2013). So it reduces the torque production capabilities of the calf, meaning the achilles, as a conduit for power transfer from the gastrocsoleus complex, has less load placed on it. This is good for individuals with ankle or foot mobility deficits as the natural forefoot rocker relies on the ability for the individual to dorsiflex at the MTP joints to rotate over those joints to get forward. So those with stiff toe joints, Hallux Valgus, etc, have difficulty dorsiflexing those joints and thus a longer lever arm is created and more force is required from the calves to propel the body over those stiff toe joints. A rocker sole takes care of that issue by artificially replacing the MTP joints and rolling the foot forward without as much work from the calves. The problem is for those with normal mechanics, that essentially means the calves can produce less power during toe-off because their lever and moment arm have been changed. So as I mentioned in the review, if an individual uses mostly their calves for propusion, while the muscle will still be working, not as much force will be generated (Sobhani et al., 2014). In regards to performance, the individual who utilizes primarily an ankle strategy for propulsion will be put at a disadvantage with an artificial forefoot rocker from a force generation standpoint if the individual has normal biomechanics. However for those that are looking to change the load upon their feet due to injuries and issues, a rockered sole may be beneficial. The calves are the primary muscles that create the torque necessary to drive the foot, ankle and rest of the body over the MTP joints, aka the forefoot rocker during propulsion. This does place a great deal of pressure and force through those joints and for those that utilize this propulsion strategy excessively, they may be at risk for metatarsal stress fractures. A rockered shoe may help from an injury reduction standpoint as it has been shown (as mentioned above) to reduce forefoot plantar pressures (Brown et al., 2004). It likely functions to help roll the foot forward over the MTP joints without as much pressure from the calves needed to roll the body over those joints. So from an injury risk reduction standpoint, a rocker shoe may be beneficial. From a performance standpoint, maybe not. I am not saying the rockered shoes have no place in the performance world or even reduce performance. I am saying that from a calf/ankle strategy standpoint, that is a possibility although that would be blind to the fact that propulsion is generated by the entire body, not just the foot. Where this rocker shoe debate gets further muddy is whether a rockered sole affects anything other than the ankle. Previously it seemed that the rockered soles primarily affected kinetics and kinematics at the ankle joint with minimal influence on the hip and knee (Boyer & Andriacchi, 2009; Hutchins et al., 2009). As referenced above, research has been done demonstrating the reduction in forefoot plantar pressures (Brown et al., 2004), achilles tendon load (Sobhani et al., 2014), and ankle plantarflexion torque (Sobhani et al., 2013). A recent article (again by Sobhan Sobahni) did demonstrate mild increases of 10-14% of extension moment peak and impulses at the knee in rocker shoes, but it seemed to vary depending on the point of initial contact (heel vs midfoot vs forefoot with the largest increases in all variables across their study occurring with midfoot landings). So as mentioned in the ankle rocker/midfoot section, a rockered sole may shift loading elsewhere. That somewhere could be to a different part of the foot/ankle or higher up the chain to the knee as potentially demonstrated in that study. This highly depends on the movement and shock absorbing strategies utilized by the individual. For those that shock absorb with extensive midfoot pronation, this may either result in increased dorsiflexion and loading at the ankle or increased knee flexion or loading at the knee (which per Long et al., (2008) seems to be <5 degrees at the ankle knee and hip with rocker shoes). Further of interest, those not used to rocker shoes show increased oxygen consumption compared to minimalist and standard running shoes (Sobhani et al., 2014). This may be due to the fact that like changing footstrike, this requires different muscle firing and thus different motor patterns, challenging the brain to adapt (which always requires more energy). It could also be that because of all the reduced torque and moment arms, the muscles have to work harder to maintain the same speed. Or it could be that you placed your body, muscles and joints in a new environment that it has to adapt to. During an adaption period, performance may decrease as new motor patterns are learned, mistakes are made and the body has to change movement strategies. So as with any new stimulus, a transition to a new type of footwear should occur gradually. I tell all my patients with new exercise programs, shoes, orthorics, environments and more that a certain "break-in" period is needed for the body to adapt. If you do not allow time for adaption, the body may either compensate poorly or become injured due to an inability to learn how to deal with new movement patterns and shock absorption patterns required. And guess what? The adaption time depends on the individual. So whether or not rockered shoes are a good thing as usual comes down to the individual (I feel like I just said that... oh wait a minute...). For those with ankle mobility deficits looking to continue running, a rockered shoe may be beneficial while for those looking to work on more of a hip or knee strategy, it may or may not be beneficial. The research suggests while load is changed at the ankle, it may or may not affect the hip/knee. However, for those that rely heavily on their calves for propulsion or their feet for shock absorption in the frontal plane, this may not be the best option in regards to performance. At the end of the day, shoes are a tool and should be utilized as such. No shoe is going to make you an Olympian or champion. That comes from smart training, years of dedication, proper care of your body, adequate sleep and more. One shoe will not work for everyone, so you need to know your body or get evaluated by an expert to help determine which shoe(s) will work best with your mechanics. So what you should do? Go out there and try things. That is the best way to learn. The footwear realm is full of things to try and new technologies and ideas are popping up every day. Thus I highly suggest keeping an open mind as you never know what you may find. Brown, D., Wertsch, J., Harris, G., Klein, J., Janisse, D. (2004). Effect of rocker soles on plantar pressure. Archives of Physical Medicine and Rehabilitation, 85(1): 81-86. Hutchins, S., Bowker, P., Geary, N., Richards, J. (2009). The biomechanics and clinical efficacy of footwear adapted with rocker profiles - Evidence in the literature. The Foot, 19(3): 165-170. Sobhani, S., Bredeweg, S., Dekker, R., Kluitenberg, B., Heuvel, E., Hijmans, J., Postema, K. (2014). Rocker shoe, minimalist shoe and standard running shoe: A comparison of running economy. Journal of Science and Medicine in Sport, 17(3): 312-316. Sobhani, S., Heuvel, E., Dekker, R., Postema, K., Kluitenberg, B., Bredeweg, S., Hijmans, J. (2017). Biomechanics of running with rocker shoes. Journal of Science and Medicine in Sport. 20(1): 38-44. Sobhani, S., Hijmans, J., Heuvel, E., Zwerver, J., Dekker, R., Postemia, K. (2013). Biomechanics of slow running and walking with a rocker shoe. Gait & Posture: 38(4): 998-1004.